New for Collabor88 may 2016 we have the [ba] san clemente casita! 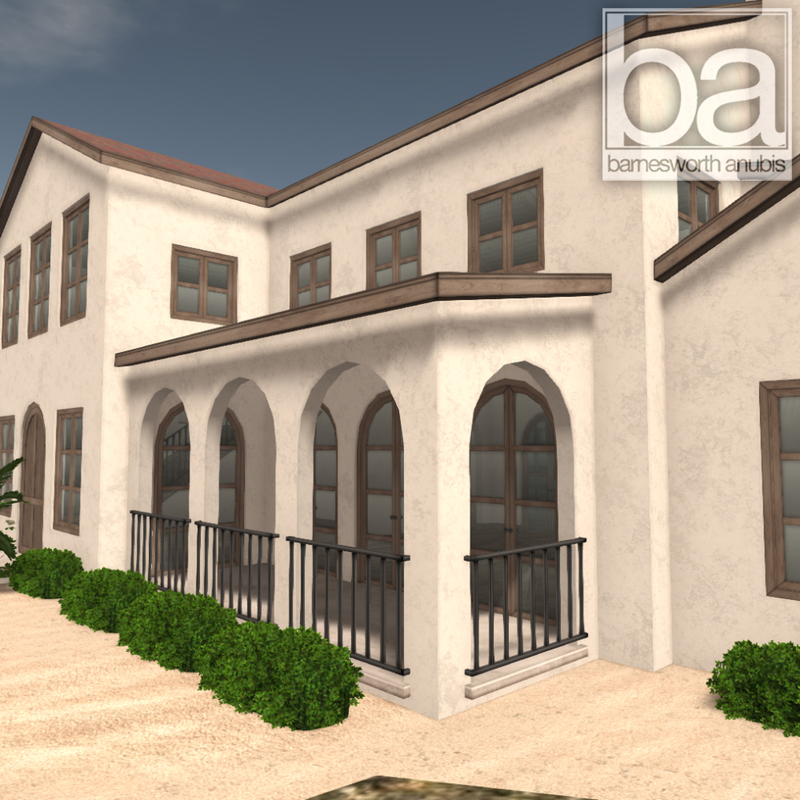 Inspired by spanish colonial architecture making a cozy and charming home. The house features a grand two story living room with working fireplace and doors leading to two outdoor patios. Attached to the living room is a master suite with en-suite bathroom. On the other side is a kitchen and dining nook, all opening onto a large patio. There are three other private rooms on the other side of the home, perfect for whatever your needs are. The house comes in at 155 prim impact (mesh), and a 32x24 meter footprint. The [ba] san clemente casita! will be available at the Collabor88 main store through June 6th at a special reduced cost. After June 6th it will be in the main store and on the marketplace at full price. Also be sure to check out the official Collabor88 May 2016 Catalog with amazing creations by many other designers! New for Collabor88 February 2016 we have the [ba] marylebone flat ! A rich and masculine studio style apartment skybox. The spacious main room contains several unique spaces and beautiful skylights. There is also a tiled bathroom off the main room. This is a skybox and the exterior of the structure is largely unfinished except where visible from the interior. Faux rooftops are also provided if you want to create a view from the window. Scripted features include an easy to use central control for access, windows, doors, and built in working fireplace. The skybox only comes in at 67 prim impact (mesh), 82 with faux rooftops and a 20x15 meter footprint. 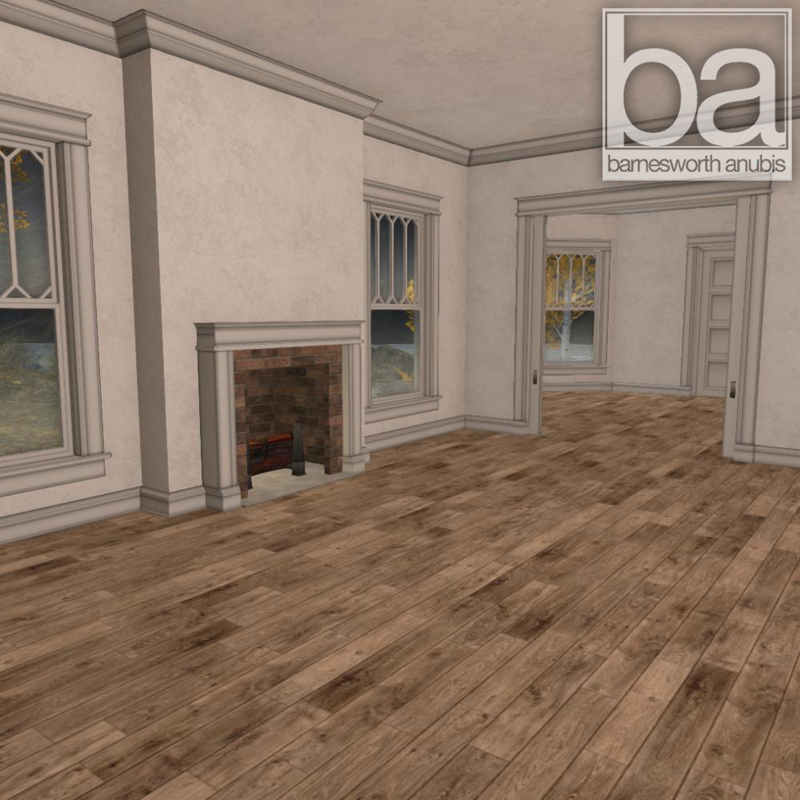 The [ba] marylebone flatwill be available at the Collabor88 main store through march 6th at a discounted price. After march 6th it will be in the main store and on the marketplace at full price. Also be sure to check out the official Collabor88 February 2015 Catalog with amazing creations by many other designers! Click image below to browse gallery of images. 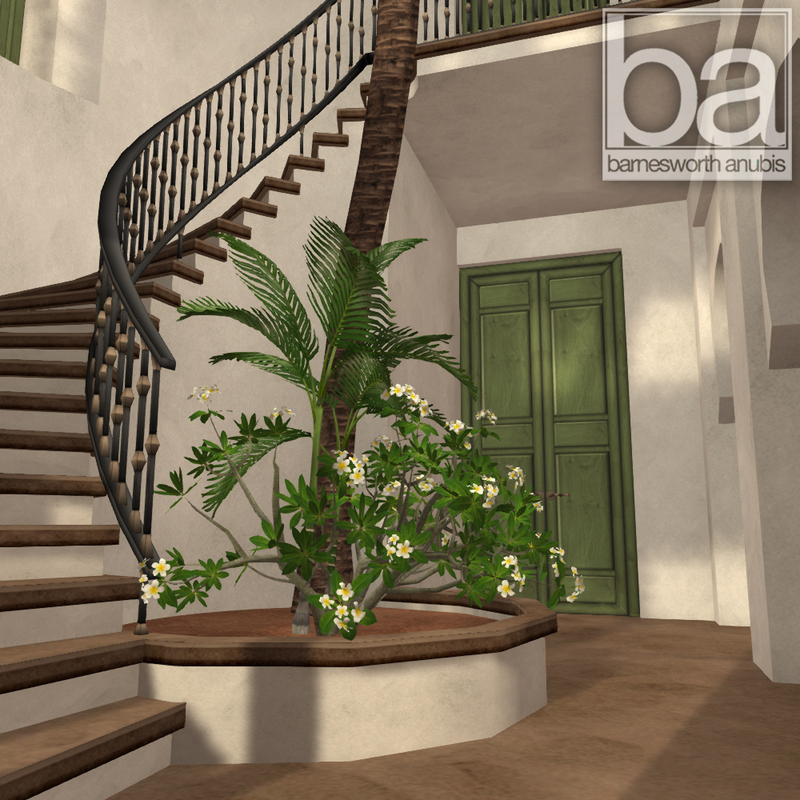 New for Collabor88 January 2016 we have the [ba] marrakech riad! Centered around a landscaped courtyard (plants included!) this open style home features two private rooms, and 3 courtyard facing open rooms. The home also has two rooftop decks with pergolas for plenty of flexibility for however you want to use it. 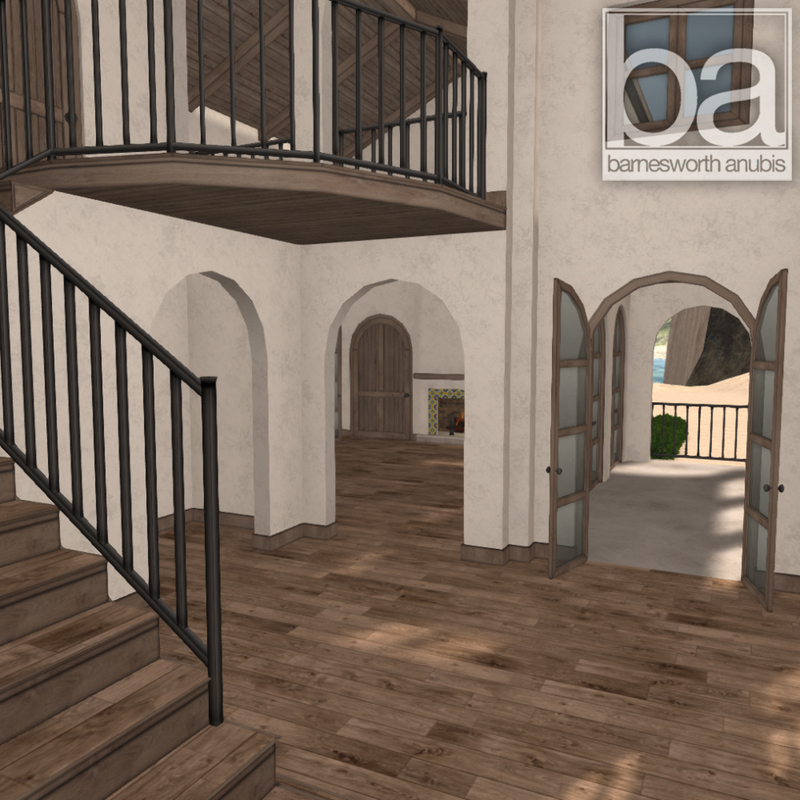 The [ba] marrakech riad will be available at the Collabor88 main store through February 6th at a special reduced cost. After February 6th it will be in the main store and on the marketplace at full price. Also be sure to check out the official Collabor88 January 2016 Catalog with amazing creations by many other designers! New for Collabor88 December 2015 we have the [ba] stockholm attic 2.0! This is a mesh version of one of my oldest skyboxes. The new skybox features more three dimensional detailing and richer texturing than the original. The backdrop is now simple three dimensional buildings instead of a flat picture providing much more depth than the original. This is a skybox and the exterior of the structure is largely unfinished but not visible from the interior. The new skybox also has 2 smaller back rooms/spaces perfect for a kitchenette and bathroom. Also provided is a snowy backdrop and snow particle effect if you wish to use the skybox seasonally or for the holidays. The skybox only comes in at 58 prim impact (mesh), and a 20x24 meter footprint. The backdrop and scenery adds 11 more prim impact or 22 with snow and increases foot print area to approximately 72x38 meters. The [ba] stockholm attic 2.0 will be available at the Collabor88 main store through January 6th at a discounted price. After January 6th it will be in the main store and on the marketplace at full price. Also be sure to check out the official Collabor88 December 2015 Catalog with amazing creations by many other designers! Marketplace - buy even if you can't log in! I know a lot of people have been waiting! In anticipation of winter holidays I have made snow caps for 2015 prefab homes! 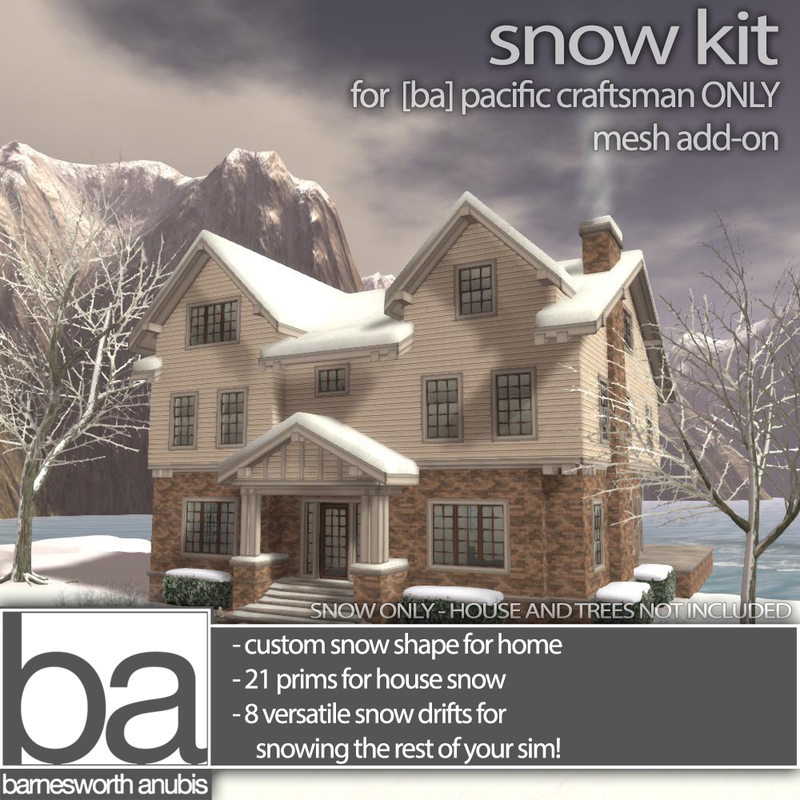 These are easy to re-texture with your own snow texture if you want it to match your terrain and they all come with extra pieces to use on other items around your home. They are also very easy to align to your home. They are available at the main store or on the marketplace for $L 100 each. 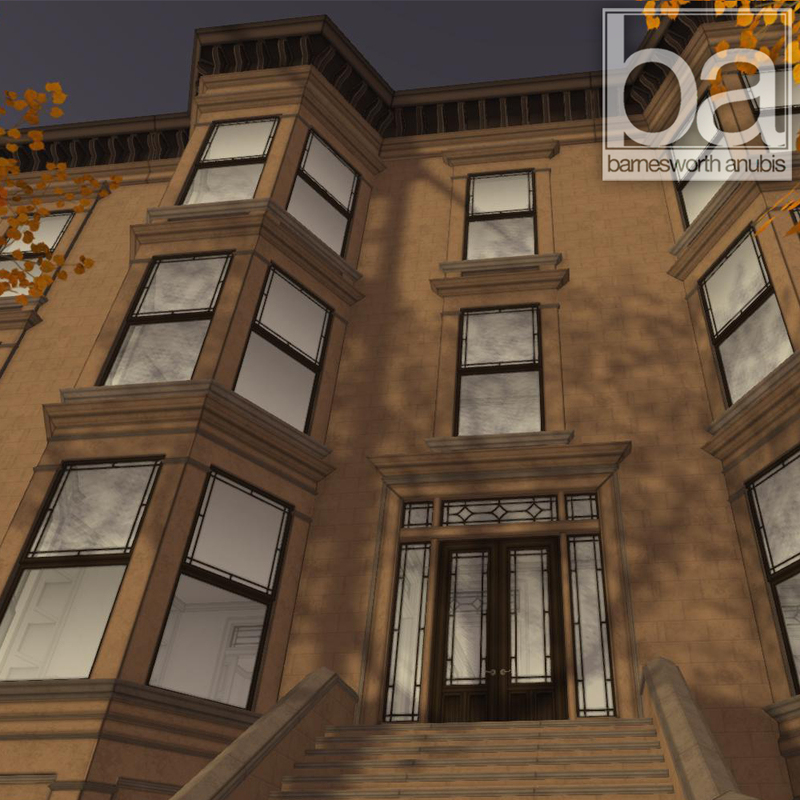 New for Collabor88 November 2015 we have the [ba] classic brownstone! The is very spacious and spread across 3 levels. The ground floor features a vestibule, entrance hall, livingroom with built in book cases and working fireplace, dining room, and kitchen. 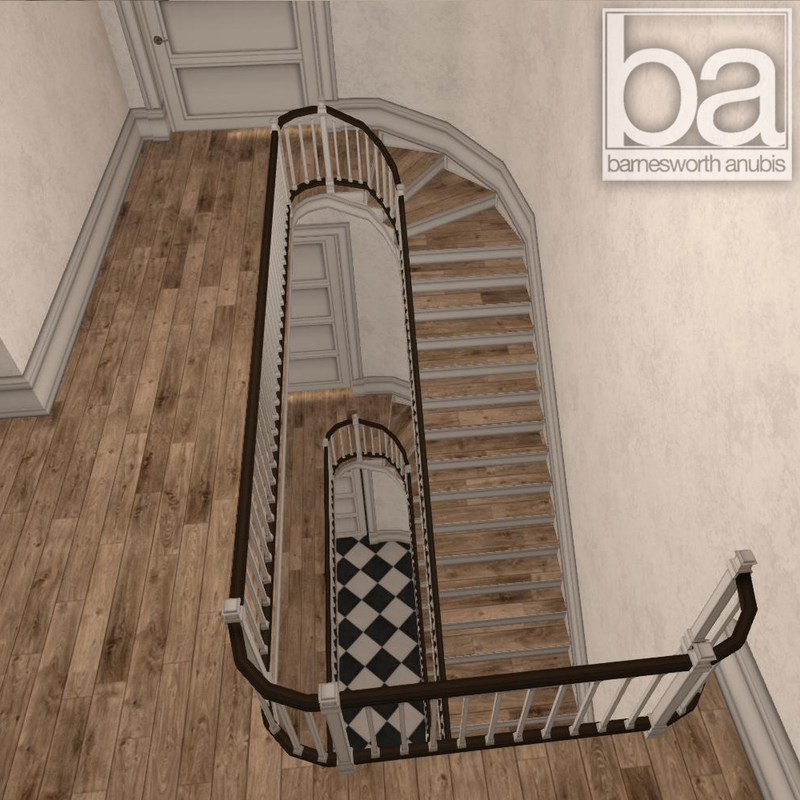 A grand three story stairwell connects to two more floors featuring 3 bedrooms and an open flexible space. Charming touches like transom windows, skylights, bay windows, beautiful wood work, and front stoop capture the classic brownstone style perfectly. The home also features an attached back garden area as well. If you are an estate owner they can be easily lined for an urban feel. With a footprint of exactly 16x48 meters they can be easily and precisely parceled off for individual occupancy. A faux brownstone with no interior is also provided should you want to fill in and make a neighborhood and space out rentals for privacy without sacrificing the feel of a row of brownstones. The homes perfectly join up to each other for a seamless look. There is an included stand alone spacer wall too should you want to incorporate other buildings or features into the neighborhood. Scripted features include an easy to use central control for access, windows, doors, and built in fireplace. The [ba] classic brownsone will be available at the Collabor88 main store through December 6th at a special reduced cost. After December 6th it will be in the main store and on the marketplace at full price. Also be sure to check out the official Collabor88 November 2015 Catalog with amazing creations by many other designers! Also available at collabor88 is the optional snow cap (sold separate) for upcoming winter season. 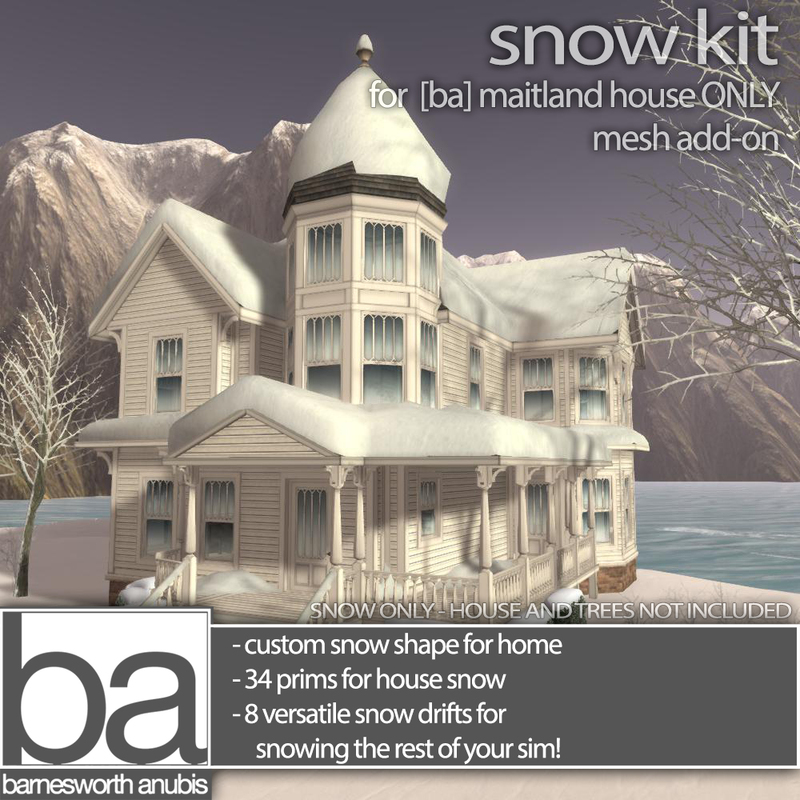 New for Collabor88 October 2015 we have the [ba] maitland house! This classic victorian style features a grand entrance, formal living room, dining room, and closed kitchen and bonus room on the ground floor. There are also generous sized front and back porches. The upper level has 3 rooms and a very spacious landing. Many nice touches like built in cabinets, opening windows and working fireplace make it very homey. The house comes in at 238 prim impact (mesh), and a 38x22 meter footprint. 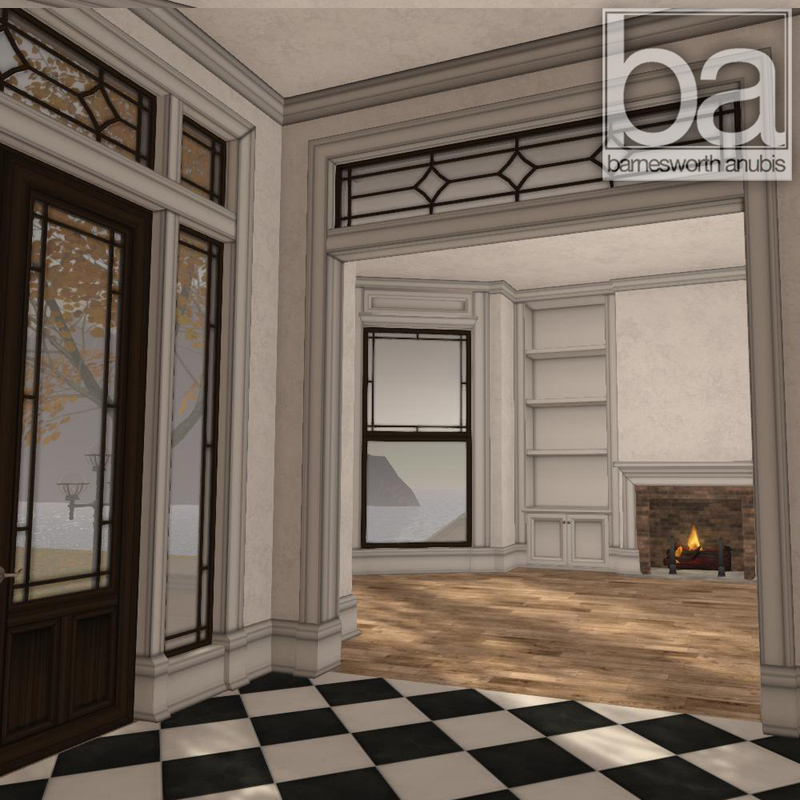 The [ba] maitland house will be available at the Collabor88 main store through November 5th at a special reduced cost. After November 5th it will be in the main store and on the marketplace at full price. Also be sure to check out the official Collabor88 October 2015 Catalog with amazing creations by many other designers! 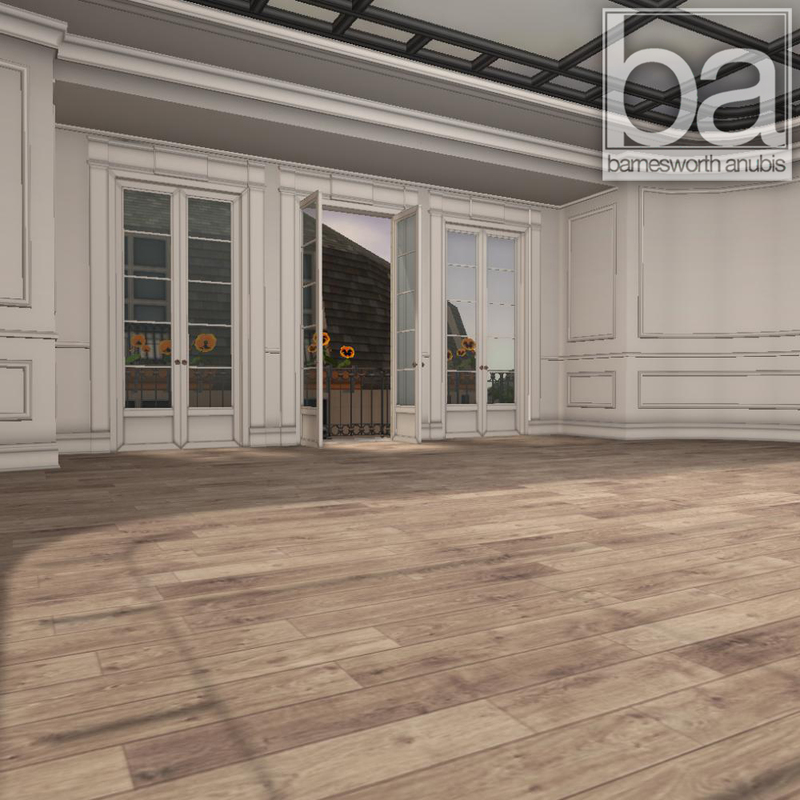 New for Collabor88 September 2015 we have the [ba] tabor cottage! This tudor style cottage features a cozy living space featuring a pass through fireplace to a kitchen and dining area. There is a cozy bedroom space on the upper level. Lovely bay windows, beams and decorative brackets make it a very personal and charming space. The house comes in at 100 prim impact (mesh), and a 25x21 meter footprint. 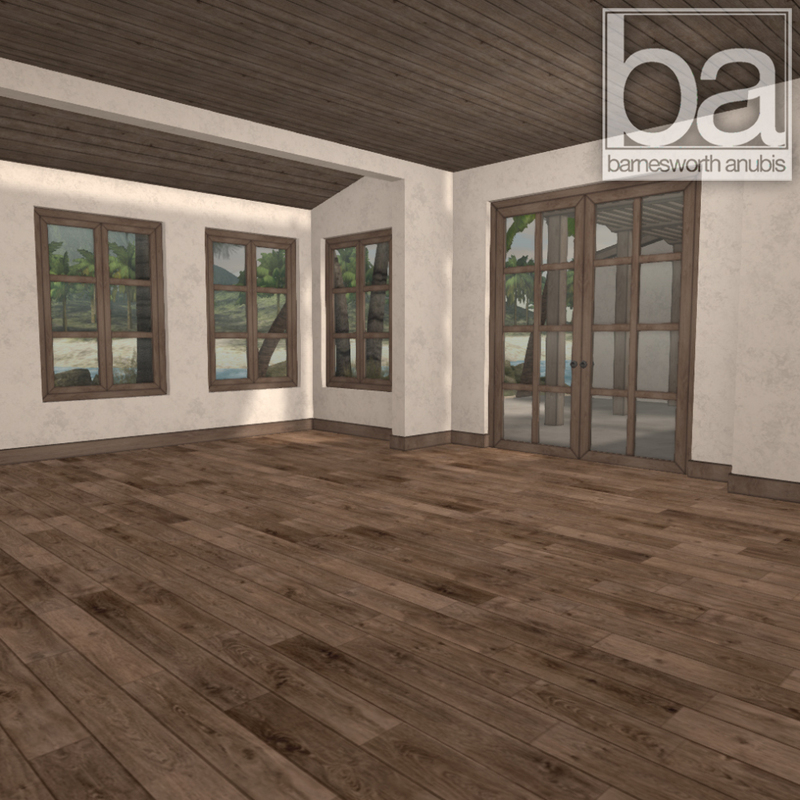 The [ba] tabor cottage will be available at the Collabor88 main store through August 6th. After August 6th it will be in the main store and on the marketplace. Also be sure to check out the official Collabor88 September 2015 Catalog with amazing creations by many other designers! 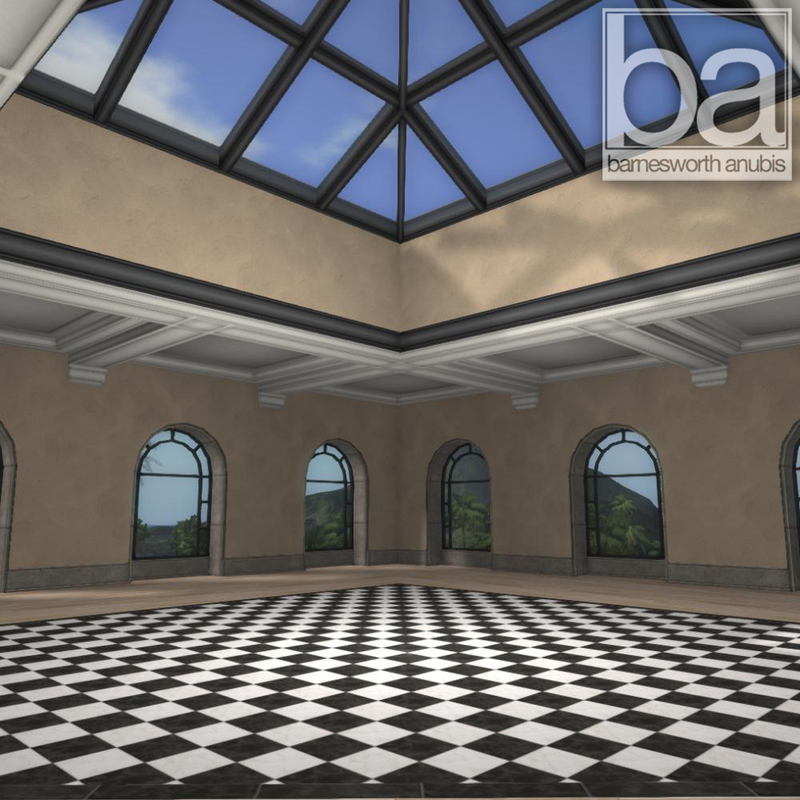 New for Collabor88 August 2015 we have the [ba] paris penthouse 2.0! This is a mesh version of one of my oldest skyboxes. The new skybox features more three dimensional detailing and richer texturing than the original. The windows have been exchanged for Juliette style balconies with functioning doors and flower boxes. The backdrop is now simple three dimensional buildings and trees instead of a flat picture providing much more depth than the original. This is a skybox and the exterior of the structure is largely unfinished but not visible from the interior. The skybox only comes in at 33 prim impact (mesh), and a 14x16 meter footprint. The backdrop and scenery adds 26 more prim impact and an area of 64x64 meters. 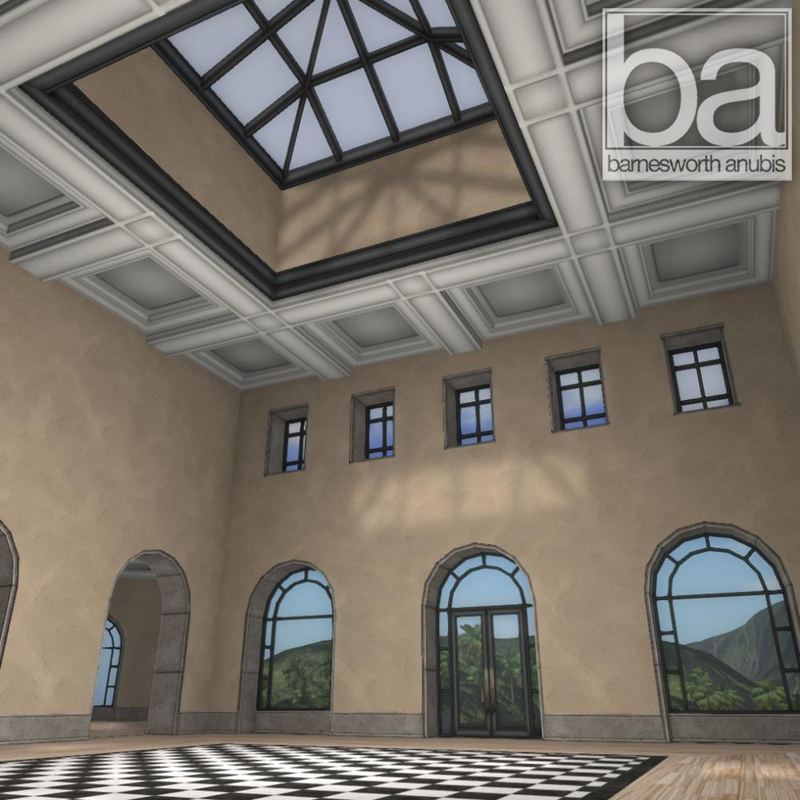 The [ba] paris penthouse 2.0 will be available at the Collabor88 main store through September 6th at a discounted price. After September 6th it will be in the main store and on the marketplace at full price. Also be sure to check out the official Collabor88 August 2015 Catalog with amazing creations by many other designers! Over the past few years I have got a lot of requests for my own main store. The store build I use is still prim (because I am too lazy to swap it out!) but I have made a very very similar new mesh shop for sale! The new [ba] plaza store features clean lined classic architecture with a spacious and versatile interior. Like all my mesh prefabs it is easy to re-color, re-texture and personalize for your own needs. The basic textures are also provided (copy only) so you can easily add new walls or parts to your store that match should you need to. The store is perfectly suited for a quarter sim, coming in at 104x104 meters and only 477 prim impact. The angled design makes it fit perfectly in a quartered sim, but can also be rotated 45 degrees to fit on a half sim with room for landscaping and display bot in front and back thanks to its unique shape. A demo has been set up in the sky so you can see the store as it comes. The build can be purchased at the demo location, in the main store, or on the marketplace! New for Collabor88 July 2015 we have the [ba] seaside cottage! This is a very rustic and intimate home. A very traditional cottage style with deep windows, shutter style windows that open and close, and a lovely exposed beam ceiling. The house features a livingroom and dining room with fireplace, kitchen and two bedrooms and one bathroom. Scripted features include a new easy to use central control for access, windows, doors, and built in fireplace. The house comes in at 111 prim impact (mesh), and a 31x21 meter footprint. The [ba] seaside cottage will be available at the Collabor88 main store through August 6th. After August 6th it will be in the main store and on the marketplace. Also be sure to check out the official Collabor88 July 2015 Catalog with amazing creations by many other designers! 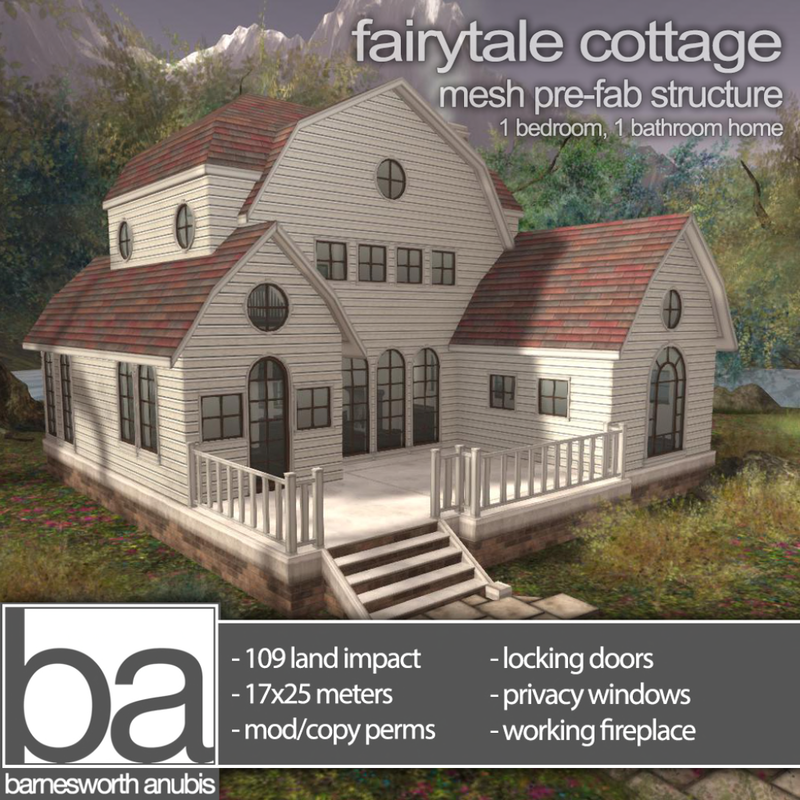 New for Collabor88 February 2015 we have the [ba] fairytale cottage! This is a very cozy and intimate home. Featuring a beautiful front and back terrace, living and dining room with fireplace, kitchen and a bedroom loft with bathroom nook. Perfect for your own little place to call virtual home! The house comes in at 109 prim impact (mesh), and a 17x25 meter footprint. 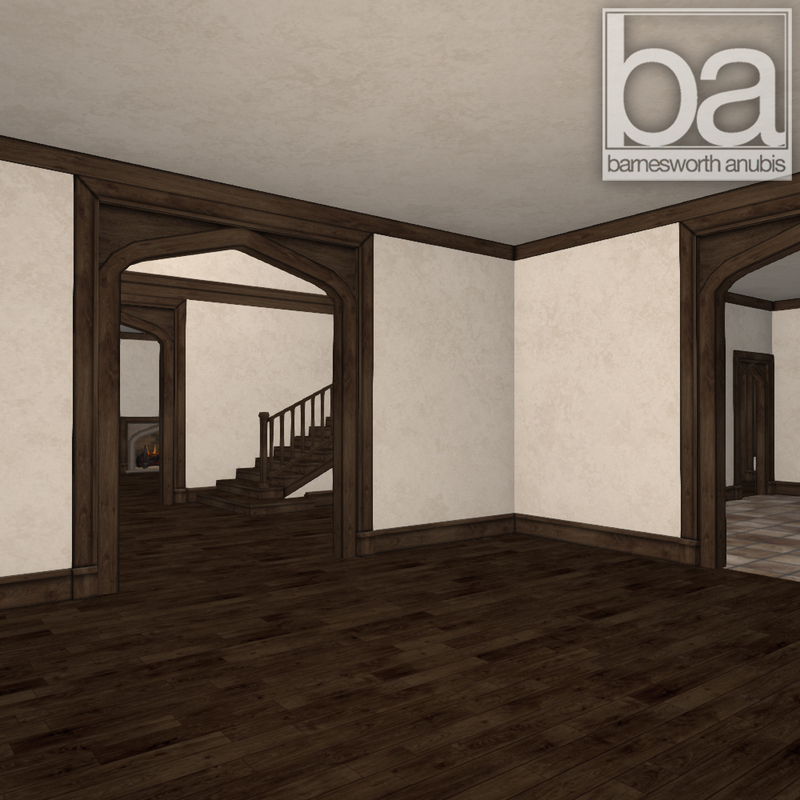 Like most of my other houses it is easy to customize wall/floor and even trim with tinting or using your own textures! The [ba] fairytale cottage will be available at the Collabor88 main store through March 6th. After March 6th it will be in the main store and on the marketplace. First off! Sorry this is late again. Had some health problems this month that set me back on this! New for Collabor88 January 2015 we have the [ba] petit chateau! This compact but luxurious home. Featuring a beautiful front and back terrace, foyer with grand staircase, living room with fireplace, bathroom, dining area, and kitchen on the ground floor this home has every space you could need. The second floor features a second spacious living area and a large bedroom. Beautiful french doors open up the home making it feel large and part of its surroundings. The home has beautiful detailing throughout for an elegant setting. The house comes in at 174 prim impact (mesh), and a 30x20 meter footprint. The [ba] petit chateau will be available at the Collabor88 main store through January 6th. After January 6th it will be in the main store and on the marketplace. Also be sure to check out the official Collabor88 January 2015 Catalog with amazing creations by many other designers! New for collabor88 December 2014 is the [ba] garden gazebo. With removable snow this gazebo is perfect for tour garden year round. The hinged windows also allow you to open the gazebo up for a more airy summer feel, or close it up tight for a cozy winter retreat. The gazebo is 22 prim impact (+5 for snow) and 10x10 meters making it a sizable and usable space. The [ba] tudor house will be available at the Collabor88 main store through January 6th. After january 6th it will be in the main store and on the marketplace. Also be sure to check out the official Collabor88 December 2014 Catalog with amazing creations by many other designers! Because I will be traveling for the holiday weekend vendors may be set up early but WILL NOT BE ACTIVATED/DISCOUNTED until Thursday evening! The sale will go through the weekend! If you wont be logging in this holiday weekend that is ok! Most deals will be available on the marketplace! 50% off seasonal decor - snow toppers and other seasonal items! Black Friday sale and 2014 snow toppers! First off with american thanksgiving approaching fast and the holidays just around the corner here is my black Friday announcement. It will be the same sale as last year, 50% off gift cards and 25-50% off selected items! The sale will be in world and on the marketplace! I will post more detailed sale info right before the sale! Also this has been kind of a hectic month for me, but I got snow toppers for the houses I have been getting requests for! So thank you for your patience everyone! I'm not sure what the demand for snow toppers for the santorini villa, villa marseille, villa siena, classic conservatory, angolo house, or 5th ave building are. Please let me know if you are planning on using snow on those this season and I will try to make them if there is enough demand! However the Bates House, Duxbury House, Key West Cottage, and Tudor home all had a great demand for snow so fast tracked those! They are up at the main store and on the marketplace along with snow toppers for the 2013 prefabs! First off! Sorry this is so late. It was a hectic month for me and also this house was a bit of a monster, so much so the uploader did not like it! But finally It is in world and ready to go just in time for the holidays! New for Collabor88 november 2014 theme of modern alchemist is the [ba] tudor house! This elegant and timeless home inspired by past times has more than enough room for your needs with a gigantic livingroom with plenty of room for a christmas tree and fireplace for hanging stockings! There is also a formal dining area, eat in kicthen, and very generous foyer. Upstairs there is a large master suite with attached bath and two smaller rooms with a shared attached bath. Inspired by the Collabor88 "modern alchemist" theme, two secret passages concealed in the walls pop open to reveal staircases to two very sizable but cozy attic spaces perfect for your secret lab or just a secluded get away. Not your thing? No problem, in each pack is a version with standard doors leading to the attic spaces for a more conventional lifestyle. The house comes in at 194 prim impact (mesh), and a 34x33 meter footprint. The [ba] tudor house will be available at the Collabor88 main store through December 6th. After Decemb 6th it will be in the main store and on the marketplace. Also available is a snow cap for instant winterizing! Designed for easy alignment to the structure and with extra snow bits for winterizing around the rest of your home! Also be sure to check out the official Collabor88 November 2014 Catalog with amazing creations by many other designers! In October of 2004 I opened my first prefab shop in Second Life. A decade later I am proud to say I am still going strong making creations for SL residents to enjoy! Instead of a sales type event, for my shops 10 year anniversary I would simply love to see how my creations have been used in your Second Life! Please dig deep in your snapshots as I would love to see new and old photos of my creations that have come and gone from your Second Life! These don't have to be fancy blogger style shots, and can even just be old casual snapshots. Prizes are not based on photo quality or decorating ability, I just want to see how people have enjoyed the homes over the years! As a thank you for your participation and support over the years, I will be awarding 10 submissions, at random, a 1,000 $L gift card, and one submission, at random a 10,000 $L gift card! These will be chosen the first week of November based on a random number generation and submission/upload order. Please limit your submissions to three, with each one being a different subject. Submissions will close Oct. 31st, 2014 at midnight SLT and winners will be selected the following week. 1) upload to flickr and add to the [ba] 10 years customer photo pool group on flickr. Important! Please be sure your Second Life user name is in the photo description. 2) Email the photo to barnesanubisphotosl@gmail.com Important! Please be sure your Second Life user name is in the FILE NAME of the image and in JPEG or PNG format. By emailing you are giving me permission to upload onto the public flickr with your SL name attached. 3) Drop the photo on me in-world, Barnesworth Anubis Important! Please be sure your Second Life user name is in the TEXTURE NAME and that it is FULL PERMISSIONS! By sharing in world you are giving me permission to download out of SL and upload onto the public flickr with your SL name attached. Thanks everyone! Please do share with friends who may have enjoyed creations over the years, I would love to see as many submissions as possible! It has been an amazing 10 years and here is to 10 more! I can't wait to see your homes!